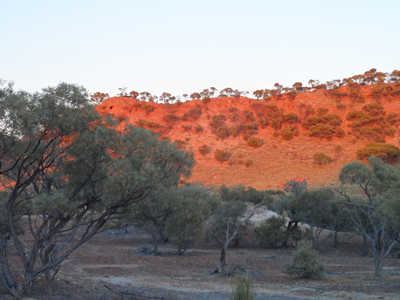 Most opal mines are in the outback around the edges of the Great Artesian Basin toward central Australia. 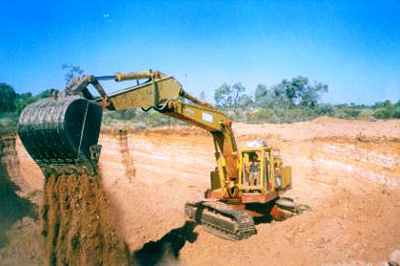 Our mining has been predominantly in the Winton area in Queensland. It’s rugged, is the Aussie outback. Just dirt tracks, and when it decides to rain you’re stuck where you are. 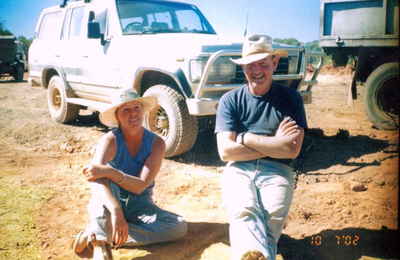 Were we pleased when satellite phones came to the bush? Before that any contact with the outside world was through the Royal Flying Doctor service. Even now there’s no power for the phones, (or TV or anything else) so the miners have generators or solar panels. Very soon we will have all the mod cons city slickers take for granted. Of course one of the big problems is water. It rains so little in the outback that there’s never enough to keep tanks full. Sometimes kind farmers have let us cart from their dam (often fed by bores sunk deep into the artesian basin). Then there are some old open mines that have become dams, or we can haul water from the council dam in Opalton. The mining community is small, so small that most miners are known by their first names or nicknames. You might know a miner for years before learning their surname or what they did in another life. Sometimes you never find out. Most miners live in camps made from whatever is available. One of the miners we know at Opalton, has the roofing iron held down, not with nails but with boulders. 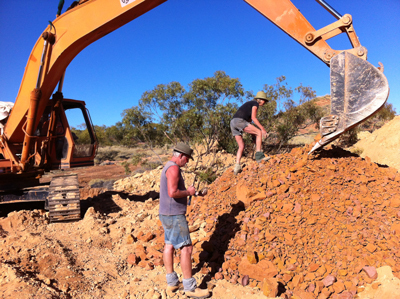 Our friend Johnno- who has mined with us over the years, has built his camp from slabs of sandstone, which came from the overburden (left over rubble) from the mines. He also built a wall from rum bottles which, he assures everyone, were kindly donated by the publican from the Tatts Hotel at Winton. There is a picture of this house published in the Age of Dinosaurs Issue 1, 2003. At the camp near Opalton, a 20 foot caravan is home, with a corrugated iron walled shower room, open to the stars at night. The runoff water from the shower is channeled down a slight slope to our veggie garden, which flourishes when we are there for long periods of time. We grow tomatoes, lettuce silver beet, beans and herbs for our own table. Gas fridges, stoves and a hot water service make life comfortable. The silence on the opal fields at night is sensational, add a big blazer of an open fire and a canopy of stars, it can’t be beaten. 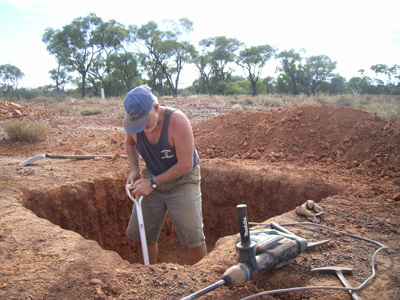 Before we can start digging there are a number of applications to complete and fees to pay. 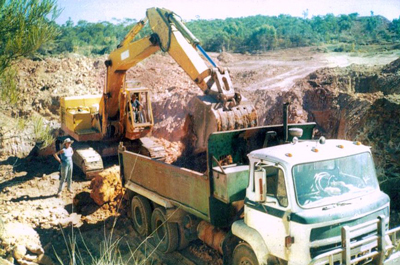 We need to apply to the Queensland Department of Mines and Energy to establish the mining lease and obtain a license, to the Environmental Protection Authority to establish a surety that the land will be rehabilitated, to the local Aboriginal people as the original custodians of the land for permission to use the land for mining and to the property owner from whom we lease the land our mine is on. Picking the right spot for a mine is the difficult thing. 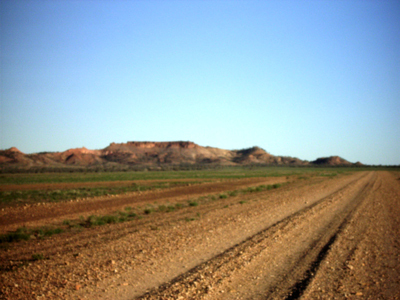 The area is opal bearing country but opal is often not where it should be; it is where you find it. 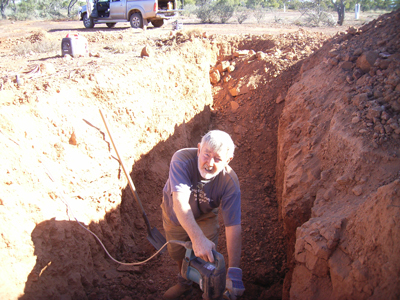 Some people say they have special or reliable ways of finding where the opal is “, some of the “old timers” seem to have a sixth sense about where to find the elusive opal. In the Opalton area mining is predominantly open cut, although there are some underground or shaft mines. 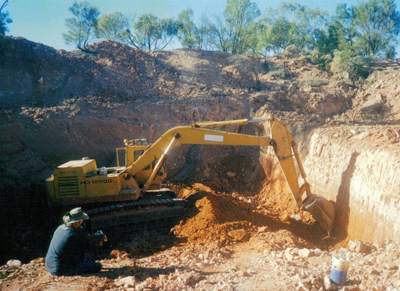 We have done both open cut and hand mining which involves digging by hand rather than with heavy machinery. 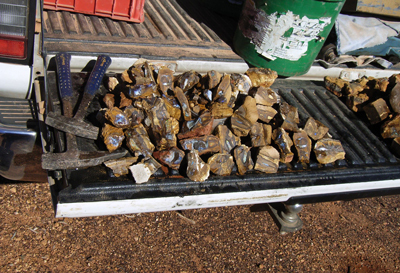 At the mine site we would look for boulders, which we split on site to see if they hold any opal. 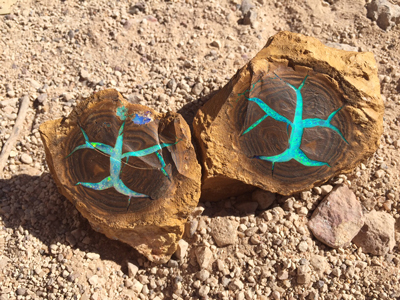 The odds of a boulder holding opal is about 1,000 to 1. 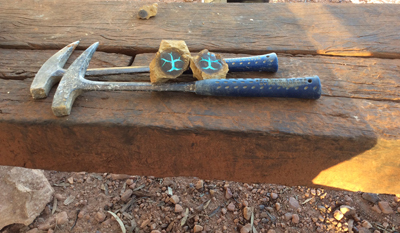 If there is any indication of opal, the rock goes back to the camp to be cut with a diamond saw to carefully expose the opal. Those are the boulders we are looking for and when we find some or even one, the shout goes up – COLOUR !!! 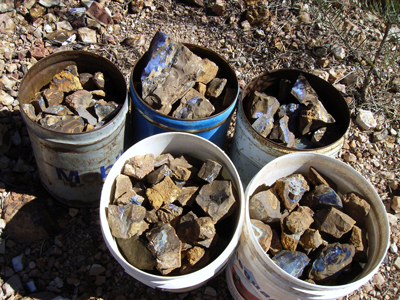 That is the most exciting time in opal mining- what we all live for is to be “on colour”. That thought of “colour” is what gets us through the long days of continuously shoveling, sifting and moving dirt and rock. It is an emotional and physical roller coaster ride, but we are all hooked. I have heard it said that “opal miners are the lunatic fringe of the gambling fraternity”. They may be from an accountant’s point of view, but, for the miner, that feeling of elation when you see brilliant colour flashing out of the brown dirt makes the gamble an investment.